Welcome to the Official Site of CLUB HORDE!! This site is designed to keep all informed on what's going on with the guild. Right now we are a very small guild, with only 41 toons in the guild, and several of those are alts of other people. I am recruiting any and all that want to join my guild. If you are interested, message anyone in the guild the invite will be extended. If there is any other questions what-so-ever about this guild please feel free to ask me via email or in game. goal for the hopefully not to distant future! To check out other events, go to our Calendar Page. THE GUILD IS LEVEL 5!!!! Now that the guild is level 5, that means we get the perk that increase guild funds by 5% of everything you loot. Hopefully that means we will get enough funds to get the next guild bank tab and also help people get faster mount speeds and better gear. Also, we have 3 toons leveling together and they have all hit lvl 77. Hopefully that means in the next couple weeks we will be 80 and start doing Cataclysm dungeons. That means we are one more step closer to doing Cataclysm Heroics! Also, with it being 3 of us doing these weekly dungeon runs, that means we are completing the weekly dungeon guild challenge. That means we are gaining 2,100,000 guild xp just from that every week. It has been quite sometime since I updated anything on the website. For awhile there I thought I was going to stop the endeavor of this sight, but fortune has had other plans for it, lol. Guild nights are regularly on sunday nights now. We have been doing dungeons the last couple of weeks, trying to help some members gain proficiency and others to play with new talents. We actually were able to complete this weeks Guild Dungeon challenges. Also, I have been adding some talent builds when I have the time. These talent builds are based off of my experiences and other sources of input. If I have not played a character atleast to the 70's, I will not bother to make my own build. However, if you have a build you would like me to add, then please send it my way and I will post it. All builds can be found on the Links page, under that classes section. With all the holidays and work, I have not been on to update the site. Since I am sure that only a handful of people even ventured here, I don't think to many people noticed. When I have been on in the last couple weeks, I have been working on the Merrymaker achievement. And it is with a big smile on my face that I say that I got it. The reason I am so happy is because this has given me the Meta-Achievement, What a Long, Strange Trip its Been! I have also decided to try my hand at suggesting some builds. My first will be a DK Blood Tank Build. This build is designed for high threat and holding aggro. It should also be usable in PvP. Please take a look at it and tell me what you think. Patch 4.3 is live! Check out all the info on the official WoW page here. I am looking forward to Void Storage to hold all those holiday items that can only be used during certain seasons. And of course I am excited about the all new Raid Finder tool. Maybe those of us ready to do some raiding can get in on that together. Here's to hopin! Another guild night has come and gone. I am really trying to get the guild members up. I know that without more people, we will not be able to do half of the things I want to do with this guild. Please put out an offer in trade chat, or if you see someone not in a guild, ask if they would like to join ours. In WoW news, they have released a demo of the MoP Talent Point System. Check it out here if you want to see what the current ideas are. Make sure to post comments if you have them because hopefully Blizzard will use those comments when the move forward into Alpha and Beta testing. I have also added the 2 most recent WoW TV Commercials to the videos page. Check 'em out if you haven't seen them already. or if you simply want to see them again. So I decided to delete the Patch Notes page, simply because I don't have the time to update the entire page every time a new patch or hotfix comes out. What I will do is provide a link to the official notes release whenever a major patch hits the live servers. I will also be revamping the home page to make it more fluid. It seem a bit abrupt as it is right now, with just jumping from section to section. Of course, this might be completely pointless being as how I am the only one that comes to this page. But it gives me something to do, and I guess that is something. THE GUILD IS FINALLY LEVEL 4! It took some time with almost no participation over the summer, but it finally happened. Only 21 levels left to go! :) Also, for those that are interested, check out the Leader Short Story for The Dark Lady. It is titled Sylvanas Windrunner: Edge of Night. Remember to check out all the Leader Short Stories. I have added a new page to the site. It is a Videos page. I will post whatever WoW related videos seem interesting enough to post. I hope you enjoy them as much as I do! I created a new widget that allows you to view the Google calendar that I have to track guild events. I will update that when ever anything gets planned. Also, Blizzcon11 is next weekend (Oct 21-22). Do you have your virtual ticket yet? I added a new roster that includes all the information that I want to display. 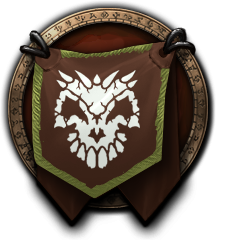 The most recent addition to the roster includes guild xp contributions. This way you can see how all your effort adds up. Okay...so I am back and finally getting into somewhat of a routine. The new schedule for Guild Nights will be alternating Saturday and Sunday nights, every weekend. That means the next Guild Night will be Saturday, October 15. I will do what I can to stay on top of the Guild Night countdown. I AM BACK!!!!! GUILD NIGHT TONIGHT!!!! Plz invite any & all who want to join the guild. Need more people if we wanna start doin dungeons and raids when the time comes!